After the initial configuration you can log on to the web interface of your system and start viewing all received mails. 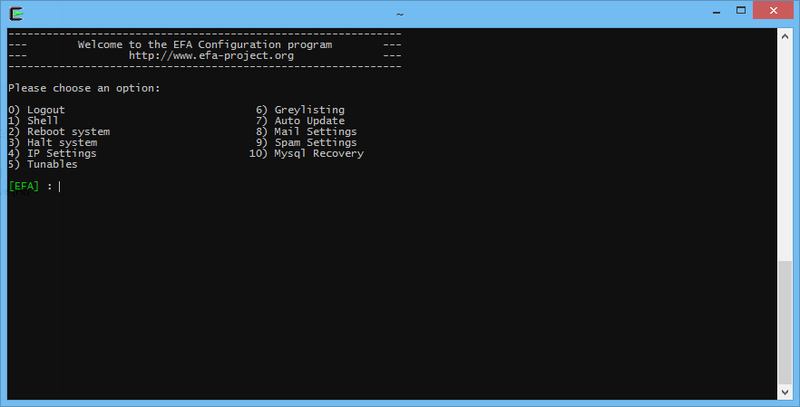 However to configure E.F.A. we have implemented an utility called EFA-Configure (menu), also for existing ESVA users we have kept webmin for system usage, however we strongly suggest to use EFA-Configure and in the case that you miss some sort of functionality please request this functionality. The web interface (MailWatch) is mainly used for daily tasks, you can view all received mail and manage your grey-listing settings under http://yourEFAserver/ or https://yourEFAserver/. No configuration Items can be made using the web interface MailWatch. When you logon using SSH with the user you created during the initial setup you will be presented with EFA-Configure, an menu driven shell that makes it easier to do common tasks. Webmin has been added to support ESVA users, who have been using webmin for a while. However, we strongly suggest that you use EFA-Configure and in the case that you miss some sort of functionality please request this. Here you can login with the user root and the password you provided during the setup.